Motherwell manager Ian Baraclough bemoaned bad defending as his side slipped to four consecutive defeats with a 2-1 loss at St Johnstone. Louis Moult's first ever Motherwell goal had the visitors in front. 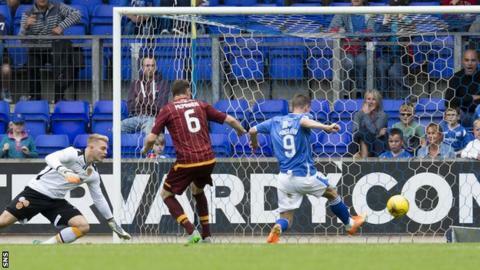 However, two Steven MacLean strikes brought Saints their first league win of the season. "Two situations on the left and on the right. You've got to defend better - simple as," Baraclough told BBC Scotland. "For the first one the full-back's been done with not a great bit of trickery. "The second one, you can't skip through two challenges like that to allow a man to put a ball in the box. "We've got to be stronger and more resolute. As the game went on we got deeper, inviting the pressure as well. That game was there for us to win." On-loan Reading midfielder Jake Taylor was issued with a second yellow card for simulation in the penalty box by referee Craig Thomson with a few minutes left. However, Baraclough disagreed with that decision, saying: "His first was for standing in front of the ball. "A St Johnstone player did it as well and never got booked for it. I asked the fourth official about that decision. "Having seen [the second yellow card incident] back, I believe he's clipped, there's contact there. It happens so quickly that to give it as simulation, I think, is the wrong decision." St Johnstone manager Tommy Wright was pleased to see his side pick up the three points for the first time this season. He said: "I thought we deserved it, we played extremely well, lots of possession, lots of opportunities. "We showed character coming back from 1-0 down, our Achilles heel again. There was a wee bit of nervousness after that but, overall, it was a performance worthy of three points. "Teams are well set up tactically and I believe the league is underestimated. The games are usually very tight and mistakes can be punished." Wright praised front man Michael O'Halloran who had a solid game for the hosts. "We got a little bit of quality from Michael O'Halloran and that set us up for two nice goals," said Wright. "I was down in England and looking for someone with pace and quality, he's getting into good positions six or seven times a game. "I keep joking with him that left-backs don't sleep on a Friday night when they know they're going to be playing against him. "He's quick, he's direct. He needs to work on his final ball a bit. "If he keeps playing the way he is, clubs will come knocking on our door. That will be disappointing for us but that's the nature of the game." Wright admitted it is unlikely he will be able to strengthen the squad before the end of the transfer window. "Nothing really happening at the moment and the squad is very strong," he said. "We're always looking to improve the squad but we have players coming back from injury."